same kind of food, wore the same kind of clothing, and participated in the same-kind of amusement. This substantial equality was enforced in part by the system of liturgies, which were services to the state rendered by wealthy men, chiefly in the form of contributions to support the drama, equip the navy, or provide for the poor. A second outstanding characteristic of Athenian life was its poverty in comforts and luxuries. Part of this was due to the low income of the mass of the people. Teachers, sculptors, masons, carpenters, and common laborers all received the same standard wage of one drachma (about 30 cents) per day. Part of it may have been due also to the mild climate, which made possible a life of simplicity. But whatever the cause, the fact remains that, in comparison with modern standards, the Athenians endured an exceedingly impoverished existence. They knew nothing of such common things as watches, soap, newspapers, cotton cloth, sugar, tea, or coffee. Their beds had no springs, their houses had no drains, and their food consisted chiefly of barley cakes, onions, and fish, washed down with diluted wine. From the standpoint of clothing they were no better off. A rectangular piece of cloth wrapped around the body and fastened with pins at the shoulders and with a rope around the waist served as the main garment. A larger piece was draped around the body as an extra garment for outdoor wear. No one wore either stockings or socks, and few had any footgear except sandals. But lack of comforts and luxuries was a matter of little consequence to the Athenian citizen. He was totally unable to regard these as the most important things in life. His aim was to live as interestingly and contentedly as possible without spending all his days in grinding toil for the sake of a little more comfort for his family. Nor was he interested in piling up riches as a source of power or prestige. What each citizen really wanted was a small farm or business which would provide him with a reasonable income and at the same time allow him an abundance of leisure for politics, for gossip in the market place, and for intellectual or artistic activities if he had the talent to enjoy them. It is frequently supposed that the Athenian was too lazy or too snobbish to work hard for luxury and security. But such was not quite the case. It is true that there were some occupations in which he would not engage, because he considered them degrading or destructive of moral freedom. He would not break his back digging silver or copper out of a mine; such work was fit only for slaves of the lowest intellectual level. On the other hand, there is plenty of evidence to show that the great majority of Athenian citizens did not look with disdain upon manual labor. Most of them worked on their farms or in their shops as independent craftsmen. Hundreds of others earned their living as hired laborers employed either by the state or by their fellow Athenians. Cases are on record of citizens, metics, and slaves working side by side, all for the same wage, in the construction of public buildings; and in at least one instance the foreman of the crew was a slave. In spite of expansion of trade and increase in population, the economic organization of Athenian society remained comparatively simple. Agriculture and commerce were by far the most important enterprises. 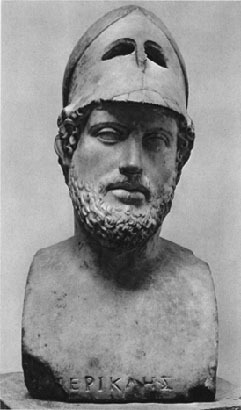 Even in Pericles' day the majority of the citizens still lived in the country. Industry was not highly developed. Very few examples of large-scale production are on record, and those chiefly in the manufacture of pottery and implements of war. The largest establishment that ever existed was apparently a shield factory owned by a metic and employing 120 slaves. There was no other more than half as large. The enterprises which absorbed the most labor were the mines, but they were owned by the state and were leased in sections to petty contractors to be worked by slaves. The bulk of industry was carried on in small shops owned by individual craftsmen who produced their wares directly to the order of the consumer. Religion underwent some notable changes in the Golden Age. The primitive polytheism and anthropomorphism of the Homeric myths were largely supplanted, among intellectuals at least, by a belief in one God as the creator and sustainer of the moral law. Such a doctrine was taught by many of the philosophers, by the poet Pindar, and by the dramatists Aeschylus and Sophocles. Other significant consequences flowed from the mystery cults. These new forms of religion first became popular in the sixth century because of the craving for an emotional faith to make up for the disappointments of life. The more important of them was the Orphic cult, which revolved around the myth of the death and resurrection of Dionysus. The other, the Eleusinian cult, had as its central theme the abduction of Persephone by Pluto, god of the nether world, and her ultimate redemption by Demeter, the great Earth Mother. Both of these cults had as their original purpose the promotion of the life-giving powers of nature, but in time they came to be fraught with a much deeper significance. They expressed to their followers the ideas of vicarious atonement, salvation in an afterlife, and ecstatic union with the divine. Although entirely inconsistent with the spirit of the ancient religion, they made a powerful appeal to certain classes of Greeks and were largely responsible for the spread of the belief in personal immortality. The majority of the people, however, seem to have persisted in their adherence to the worldly, optimistic, and mechanical faith of their ancestors and to have shown little concern about a conviction of sin or a desire for salvation in a life to come. It remains to consider briefly the position of the family in Athens in the fifth and fourth centuries. Though marriage was still an important institution for the procreation of children who would become citizens of the state, there is reason to believe that family life had declined. Men of the more prosperous classes, at least, now spent the greater part of their time away from their families. Wives were relegated to an inferior position and required to remain secluded in their homes. Their place as social and intellectual companions for their husbands was taken by alien women, the famous hetaerae, many of whom were highly cultured natives of the Ionian cities. Marriage itself assumed the character of a political and economic arrangement, devoid of romantic elements. Men married wives so as to ensure that at least some of their children would be legitimate and in order to obtain property in the form of a dowry. It was important also, of course, to have someone to care for the household. But husbands did not consider their wives as their equals and did not appear in public with them or encourage their participation in any form of social or intellectual activity.